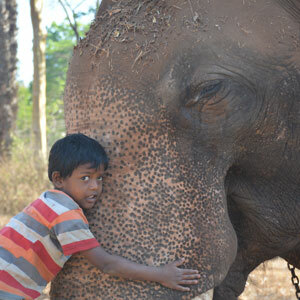 Tribal elephant keepers called mahouts share an ancient, incredibly deep bond with these majestic animals. Now, as development encroaches upon their forest homeland, mahouts are abandoning their traditional occupation for more modern livelihoods. The timing of this is particularly troubling, since now more than ever, the legendary skills of the mahout are needed to prevent disturbing consequences as these pachyderms clash with people. Settled beside a paved, bumpy road in Nagarhole National Park lie fifty acres of flat dirt splattered with brightly colored blankets, cookware, tools, tents, and small shacks, about a hundred exquisite individuals, and thirty-four massive, captive gray gods. Welcome to the Anechowkur Elephant Camp, in the Nilgiri Mountain range of southern India. The camp consists of 30 concrete homes, each 50 square feet and barely big enough to fit a twin size bed, knick knacks and posters of the occupants’ favorite deities. Mother and father share the bed while two or three children cuddle on the concrete floor. The rest of these Jenu Kuruba tribal members pitch tents made of tree limbs, rope, and tarp. All of them cook over open fires. Lush evergreen jungle, home to hundreds of species of birds, monkeys, wild elephants, and tigers, surrounds the camp. And everywhere, it seems, there are elephants, browsing, walking, drinking, and throwing so much dust on their backs they seem to be standing in a cloud of mist. The people living on this site are a rare lot who share their whole life and breath with these wild creatures. For thousands of years, humans have been fascinated with the size and strength of elephants. Great and powerful kings thought their power rested with the number of elephants they possessed. They used these elephants in battle, and would choose only the bravest and most knowledgeable tribal members to work with these giants within their kingdoms, to become elephant trainers or mahouts. The mahouts captured, trained, and lived with these elephants for the rest of their lives. In this lone and rural tribe they speak a dialect of Kannada so extreme there isn’t even a written form. Man, woman, and child all play a role in the daily routines of this community. Boys begin training to become mahouts as soon as they can walk and talk. The adult men are stoic and small in stature. They may lack in size due to weather, malnutrition, and working conditions but they are mighty in voice. They belt calls to their elephants from the pits of their stomachs and the elephants submit to their masters without hesitation. The boys yearn to command their own elephants and eagerly learn from their fathers the techniques to control these terrifyingly beautiful beasts. Boys at the age of six were prodding and commanding these massive creatures, several times their puny size. In Karnataka, a state where children are mandated by law to attend school, these mahout children stay home to learn life lessons from their parents. A 10-year-old boy named Dinesh laughed and said, “Who needs school? I’ll learn what I need to from my Papa.” The adult women walk with grace in their dirt-stained and shredded saris as they begin their tasks of cooking and cleaning. They travel in groups several kilometers to the nearest town for food and other supplies. They are reserved but proud and support their husbands completely. The elephant remains one of the most essential deities of Hinduism. The most popular god is Ganesh, an elephant headed figure. Ganesh symbolizes many things: auspiciousness, strength, powers of discrimination, and intellectual prowess. The elephant is the largest and strongest of all the animals in the Indian jungles, yet affectionate and loyal to his keeper. He is swayed by love and kindness extended to him. He is also strong, yet when in a rage he destroys anything in his path. Elephants continue to be worshiped in modern times, but the job of the mahout has dwindled. These days, Jenu Kuruba mahouts are nothing more than government employees. Paid at most Rs. 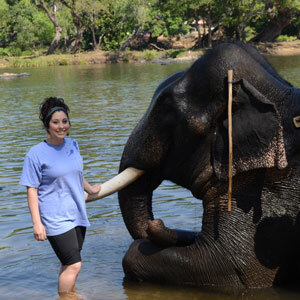 15,000 a month, which roughly translates to $250, being a mahout is no longer a prestigious position. With low wages, desolate lands, and deteriorating conditions, the government has unwittingly cultivated a culture of decline for modern day practitioners of this traditional occupation. Still, the mahout practice is not taken lightly by this community of individuals. They feel they are providing a critical service by risking their lives and livelihood for the protection of their land and people. The mahouts care for these captive elephants 24 hours a day, every day. This includes feeding 34 elephants more than 10,000 pounds of food, bathing each elephant twice a day for more than three hours at a time, and training them with more than 120 major commands. Why is this profession so important to India? According to the conservation group Defenders of Wildlife, there are only 35,000-40,000 Asian elephants left in the entire world, with over 22,000 of those residing in India. More than 1.27 billion people live in India with the population increasing every day. As India continues to grow, more land is developed. Forests are being cut down, resulting in the loss of food resources for these elephants. This is a problem because, as a National Geographic study concluded, elephants can eat more than 300 pounds of food per day. In Nagarhole National Park, visitors can see browsing elephants with rib bones clearly visible beneath their skin. Felix, a forest ranger at Anechowkur, recalled the elephant and human death toll of 2013 with quiet sadness. “Yes, outbreaks of wild elephants have continued to increase. Last year we lost 64 elephants and 106 people,” he said. Agricultural leader and senior manager, Dr. Ponnapa of Ashok Pollibetta Coffee Estate, recognizes the issue. “The first problem lies in the continuous building of industry. This is good for India to advance but what is happening is there is an area in the middle of the Western Ghats that India recognized as the elephant corridor, where an excess of elephants reside,” he said. “This land is being bulldozed and businesses are being built. These elephants are being forced out of their natural habitats to find other places to live. We are pushing them out, and by natural will and instinct to live, they are trampling people’s homes and rummaging through farmland to survive. At such a time it is crucial we are able to get in touch with the mahouts.” He notes that the mahouts bring their captive elephants and hunt the wild ones, stalking them for days, until finally they are cornered and can be tranquilized and transported to a safer area. Park rangers are trained to “handle” elephants, but there is just something about the way mahouts do it. It is like their elephants comprehend the immensity of this job and do it flawlessly. Even the wild elephants seem to grasp the importance of subjecting themselves for a greater good. Ponnapa sees the mahouts as one model for man and elephant living together. “If we are to both survive in this world, we must learn to co-exist. We must learn to handle each other with care,” he said. The bigger problem, currently, is that due to the immense stress on this profession of mahouts, the younger members of the tribe are beginning to choose alternate lifestyles. The mahout practice is dying out, according to an elephant conflict study conducted in the southern regions of India, because the socio-economic status of the mahout does not deem him elite, but demeans him as nothing more than a dirty animal keeper. While doing the best they can under their circumstances, the government continues to undermine the mahouts’ service as mediocre. While I was in India, the mahouts of Anechowkur Elephant Camp went on strike to protest against a tribal member being arrested as a suspect in a nearby forest fire. The mahouts abandoned the camp and their elephants for two days. Within that time their elephants did immense damage to the camp, tearing apart tents that families lived in. This time, the mahouts came back and rebuilt. But imagine what would happen if this cultural tradition didn’t exist. What can be done with troublesome wild elephants? Religion plays a major role in the way Indians regard elephants. No one wants to intentionally destroy elephants, because they are objects of worship. Mahouts must walk a fine line between worshiping and respecting this mammal and breaking it to submit to their will. The Indian Wildlife Act of 1972 declares wild animals as government property and states no one can intentionally harm or kill an elephant. These elephants can’t even be used to work without direct consent from the government. This would include using them on holy days and parades. But with constant elephant intrusions in farmlands and plantations, conflict and death is becoming inevitable. In addition, the natural ecological balance in the tropical rain forests of India is being thrown off-balance as both elephants and resources are diminishing. Troublesome wild elephants can’t even be relocated because forestry researchers say they will just follow each other back to their former homes. The only solution seems to be for the mahouts to capture elephants, a few at a time, and break and train the animals to live with them in their villages. For these people, their entire life revolves around these elephants; some members of Anechowkur have been with their elephants for over 40 years. A bond forms that is hard to understand unless you see it. With a flick of a tongue or a twitch of a wrist the elephants understand exactly what their masters are saying. What is even more incredible is that these massive creatures ultimately and completely submit themselves to their master. The training process, however, is a long one. Several of the best trained mahouts will band together and travel into human/ elephant conflict areas to stalk wild elephants for several days until they can corner them, tranquilize, and transport them back to their villages. When they arrive back they will unload the wild elephants and the captive elephants will lead them into their cages. They will trap them until the cage of logs is built tall enough that the wild elephant can’t escape. The captive elephant will then climb out while the cage is completed. The cages are built by the captive elephants under the direction of their mahouts. One cage can take about nine hours to complete. The wild elephants will be kept in these cages for around three months as the mahouts work to break their spirit. They begin training them while inside the cages. They are finally ready to live outside their cages once a mahout can mount and ride an elephant. This cultural tradition may not survive without changes, however. And changes are yet possible. First, beginning with the rural areas, there must be more of an overall awareness of the culture of the mahouts and their importance and positive impact in the regional eco-system. The Indian school systems need to begin adding this portion of their history into their curriculum. To quote philosopher Thomas Carlyle, “Let each become all that he was created capable of being.” Helping these unique tribal members feel important again could be the first step in halting the decline of this ancient Indian tradition.